BC’s doctors are at the forefront of change, as we strive to provide the best quality patient care and to build a stronger health care system. At Doctors of BC our role is to enable change to happen. Doctors of BC recognized long ago that collaboration is good medicine for everyone. Within the past 10 years, our relationship with the government and Health Authorities has evolved to produce a strong collaborative working environment – and here’s why. Much of the credit for this new era of collaboration belongs to the creation of a number of Joint Collaborative Committees made up of equal representation from Doctors of BC and the BC government. Funds from the Physician Master Agreement (PMA) negotiated with the BC government are allocated to these collaborative committees. This “first of its kind in Canada” approach sees the Joint Collaborative Committees comprised of the General Practice Services Committee (GPSC), the Specialist Services Committee (SSC), the Shared Care Committee (SCC) and The Joint Standing Committee on Rural Issues (JSC) developing programs and initiatives to improve BC’s health care system and deliver quality patient care. This unique partnership gives physicians a real leadership voice and the people of British Columbia the strong advocacy needed to maintain quality patient care. For an overview of a recent JCC event featuring many quality improvement JCC initiatives, please click here. The General Practice Services Committee (GPSC) recognizes the challenges facing today’s primary care physicians, and develops and implements programs and initiatives that help improve primary health care for patients and the physicians’ working environment. GPSC was launched at a time when few BC medical school graduates were choosing family medicine as a career and a growing number of GPs were nearing retirement. Since its inception in 2002, the GPSC has changed the way family doctors work and how they care for their patients. With the understanding that family doctors have long-term relationships with their patients and an in-depth understanding of their communities’ health care needs – Divisions of Family Practice are regional groups of family doctors working together to improve their clinical practices, offer comprehensive patient services, and influence health service decision-making in their community. There are currently 35 Divisions of Family Practice in more than 230 BC communities working together to enhance their practice and address gaps in patient care. Each Division is responsible for identifying the gaps that exist in patient care in a Division’s community and for developing solutions to their own particular issues. Divisions of Family Practice work in partnership with their health authority, the GPSC, and the Ministry of Health Services (MoHS). The Practice Support Program (PSP) is a training ground for physicians in both the delivery of patient care and in building capacity in a practice using innovative clinical and practice management tools and strategies. Professional development is a core part of being a physician. The PSP offers a flexible service delivery model that works with physicians’ busy schedules and/or regional barriers. The PSP includes physician-led training sessions, small group learning sessions, in-practice coaching, a peer support network and a foundational leadership and management program offered through SFU. PSP is just one of the many important GPSC initiatives, and works in partnership with the Shared Care Committee and the Specialist Services Committee. The purpose of the Joint Standing Committee on Rural Issues (JSC) is to enhance the delivery of rural health care, and the availability and stability of physician services provided in smaller urban, rural and remote areas of BC. The Joint Standing Committee on Rural Issues (JSC) administers a number of rural programs. JSC has also established a variety of one-time and on-going programs to address other key areas: such as supporting hospital-based core services, responding to rural communities in crisis, and supporting the onboarding of new physicians into rural communities. Download the Rural Programs guide, here (pdf). Shared Care helps foster collaboration between family and specialist physicians to ensure barriers are removed for patients as they move from primary to specialist services. The relationship between the family and specialist physicians is fundamental to the delivery of effective health care, especially for more complex patient populations. Today many family and specialist physicians are working together through Shared Care initiatives to improve patient flow, bridge care gaps and improve the delivery of quality patient care. The Divisions of Family Practice are frequently the drivers of Shared Care work. The Specialist Services Committee (SSC) supports the delivery of specialist services through facility-based physician engagement, enhancing specialist services, and advancing quality improvement. SSC also supports specialist training in leadership and quality improvement. Recognizing there are many different specialists groups with their own specific focus and challenges – SSC works on behalf of all specialist to address care gaps, improve collaboration and increase coordination of specialists care to better support the delivery of specialist care to patients. BC’s doctors care about quality patient care, but they also care about keeping British Columbians healthy. Doctors of BC has a long history of involvement in health promotion advocacy. We actively promote education and awareness on the importance of physical activity, nutrition, environmental health, and road safety. Strong political advocacy is an essential part of promoting positive change in today’s society. With complex government and Health Authority organizations, developing relationships is more important than ever before. 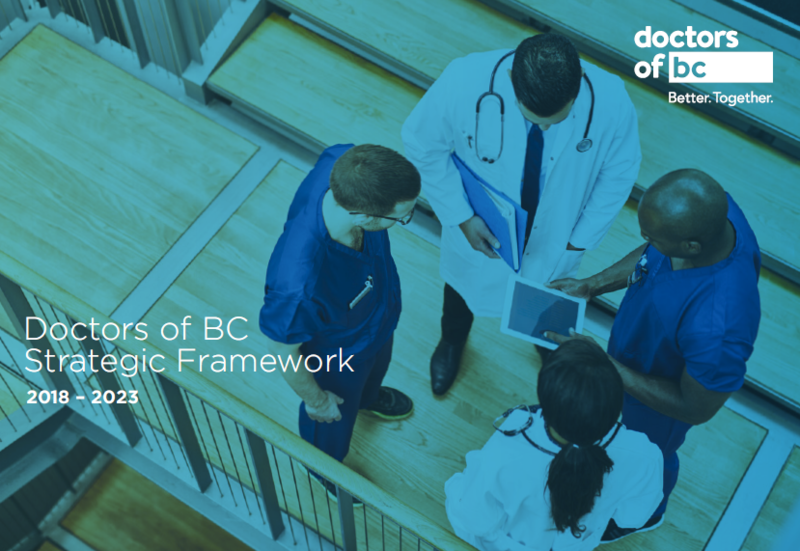 As part of our mission, Doctors of BC works to promote a social, economic, and political climate where members can provide patients with a high standard of healthcare. To achieve this goal, we develop policy that represents the collective view of the membership on issues of importance to the medical profession and to our patients.